Chris Martenson’s Peak Prosperity, the organization he founded, remains a primary source for the latest sustainability news, information, and views used in this newsletter. The website provides plenty of free information, which I use, but additional information is available only to paying members. In my estimation, any commercially orientated organization providing trustworthy sustainability services deserves public support, and Peak Prosperity readily qualifies. Chris’s Big Picture perspective encompasses all interrelated sustainability areas, a balanced expertise that most sustainability proponents lack. In his previous career, he was a successful businessman living an urban, upper-trending lifestyle. But the more he learned about the principal R’s (Energy, Economy, Environment, and Equality-Equity) the more he realized how serious worldwide conditions were becoming. So he and his family bravely forsook their former upscale lifestyle, and transplanted themselves to a rural, environmentally conscious, and sustainable way of life. In sum, Chris is no hypocrite. He and his family are fulfilling everything he and his colleagues write about on Peak Prosperity. In Chris’s most recent commentary [see first article in Views, Betrayal! ], he approaches a topic that he admits is a psycho-emotional downer. After all, no one enjoys being duped by trusted persons, institutions, corporations, or organizations, as when being denied important information, or worse, provided misleading or false information (lies, fake news). Yet, this is exactly what’s happened and continues happening, every day, and in every way. Just think of the ongoing deceptions propagated by prominent politicians, religious groups, corporations, and institutions. Chris mentions some relevant examples in his article. If you’re experiencing any form of betrayal, Chris offers some practical solutions. But you might need to join Peak Prosperity to learn specific ways to deal with and overcome this social malady. Should we trust him to provide accurate, helpful information? So far, yes! > Peak Prosperity: Betrayal! (Chris Martenson). 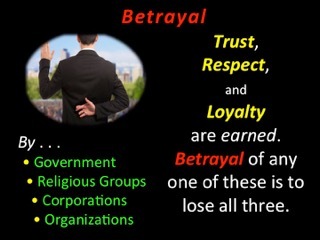 Betrayal is the sense of being harmed by the intentional actions of a trusted person or institution. We’re betrayed every time our trust is violated, in small ways or large. Some politicians have betrayed us, and the very institutions, both public and private, that we rely on are often fleecing us more than serving us. It turns out the best strategy is to trust nobody. > Resilience: Sleepwalking Is A Death Sentence For Humanity (John Foran). Neoliberal capitalism’s multiple crises are mostly the effects of rampant privatization of public goods and services, notably obscene inequality and unparalleled concentrations of wealth and power. The sociology we now need needs to be founded on the reality that everything is interconnected. The only real systemic “solution” to the crisis is a broad yet more radical climate justice movement willing to confront the root causes of the crisis, including capitalism. > Resource Insights: Resource Insights: Puerto Rico: When The Electricity Stops (Kurt Cobb). When the electricity stops in modern civilization, pretty much everything else stops, including pumping of gasoline and water. When deciding on how and what to rebuild in Puerto Rico the U.S must decide on how much to spend on making infrastructure climate-change proof. One unparalleled danger to the electric grid that dwarfs climate change threats is electromagnetic pulse or EMP, either as a coronal mass ejection or a nuclear bomb detonation. > Huffpost: Will Puerto Rico Be The Prequel To Global Post-Climate Change Dystopia? (Miles Mogulescu). Dystopian novels and movies portray a post-apocalyptic world in which a small wealthy elite revels behind gilded walls, while most people in the hinterlands struggle for survival, often pitted against each other in armed gangs and tribes. It’s time to take our heads out of the sand and realize that climate change is an existential threat to civilized life in the U.S. and around the world. > Peak Prosperity: the Waiting Is The Hardest Part (Adam Taggart). Those waiting for the financial markets to experience some sort (any sort!) of pullback have been waiting a long time. The stock market is now 70% higher than it was at the previous bubble peak immediately preceding the 2008 Great Financial Crisis. Reflect for a moment how painful the crash from Oct 2008-March 2009 was. How much more painful will a crash from today’s much dizzier heights be? > The Guardian: Brazil’s Worst Month Ever For Forest Fires Blamed On Human Activity (Sam Cowie). September saw more fires than any month on record, as experts say uptick is due to expansion of agriculture and reduction of oversight and surveillance. The National Institute of Space Research (INPE) has detected 106,000 fires destroying natural vegetation so far this month—the highest number in a single month since records began in 1998. > Huffpost: Hidden Dangers Of The Coral Reef Crisis (Rachael Willis). According to one 2014 analysis, coral reefs can take 97 percent of the energy out of incoming waves, by dissipating wave energy, acting as surge breakwaters and reducing the effects of seaside erosion. They play an integral role in protecting and sustaining coastal communities. Coral degradation is one of the most pervasive impacts of pollution and climate change worldwide, including U.S. coastlines, especially in Florida, which is highly exposed to ocean surges. > Common Dreams: Subsidizing Earth’s Demise: US Taxpayers Forced To Prop Up Dirty Energy Industry (Jessica Corbett). A recent analysis found that damage from extreme weather intensified by climate change and the health impacts from using gas, oil, and coal have cost the U.S. economy an annual average of $240 billion in the past decade. Industry subsidies in the form of financial handouts, flexible liability policies, and tax breaks cost U.S. taxpayers more than $20 billion each year, $14.7 billion at the federal level and $5.8 billion at the state level. > The New York Times: 48 Environmental Rules On The Way Out Under Trump (Nadja Popovich). To date, the Trump administration has sought to reverse 48 environmental rules. Regulations have often been reversed as a direct response to petitions from oil, coal and gas companies and other industry groups. The E.P.A. has been involved in one-third of the policy reversals identified by The Times. Scott Pruitt, who now heads the EPA, previously sued the agency more than a dozen times. > Ocean Conservancy: Scientists Shocked: Plastics, Not Santa, Near The North Pole (Nick Mallos). News reports last week highlighted the growing problem of marine debris reaching the far corners of our ocean. Chunks of plastic have been found on remote frozen ice floes just 1,000 miles from the North Pole, the first such find in an area previously inaccessible because of sea ice. Scientists say it’s one of the most northerly sightings and fear that climate change is causing ice melt to send material there. > Common Dreams: Global Demand For Meat Amounts To ‘Appetite For Destruction,’ Says New Study (Julia Conley). In a study titled “Appetite for Destruction,” the World Wildlife Fund (WWF) revealed on Thursday that humans’ consumption of meat is having a devastating impact on global biodiversity. In addition to causing greenhouse gas emissions and using up huge quantities of water and land, industrial farming requires massive amounts of crop-based feed for animals. > Inside Climate News: After The Hurricanes, Rebuilding For Energy Efficiency (Lyndsey Gilpin). Builders of prefabricated, zero-energy homes built for storm resilience have seen a spike in calls, particularly from the Florida Keys and Virgin Islands. Prefabricated homes, manufactured in a factory and then assembled on-site, are designed to reduce energy loss and are built ready for solar panels to allow customers to go off-grid and still power up when the grid goes down in a storm. > Think Progress: This Stunning Statement From General Motors Will Keep Big Oil Up At Night (Joe Romm). “General Motors believes in an all-electric future,” Mark Reuss, GM’s head of global product development, announced in a corporate press release last week. When you add in plans from huge, fast-growing markets like China and India to quickly shift to EVs and end the sale of petrol cars, it’s clear that upending the car market will also upend the oil market. > Midwest Energy News: Michigan Cycling Advocate Seeing Big Results From Thinking Small (Howard Lovy). In Traverse City, Michigan, Ty Schmidt is working hard to encourage more walking and biking to schools, within a 2-mile radius. From the political perspective, the more normalized walking and biking become, the greater the demand will be for creating cities more connected with safe, comfortable, and intuitive street and public space designs. Norte, a grass-roots bike movement, is taking the message regional and, eventually statewide. > Utility Drive: A Trio Of Storms Could Mean Grid Modernization In Hard-Hit Areas (Robert Watson). In Puerto Rico there’s an opportunity to rebuild a more resilient system rather than patch up an antiquated grid. [Tesla CEO Eon Musk tweeted Thursday that his company offers to rebuild Puerto Rico’s power grid to run on solar power and batteries.] Systems in Texas and Florida are being examined carefully to determine how best to build greater resilience into them. > Futurism: A New Material Is Able To Create Hydrogen Fuel From Seawater (Chelsea Gohd). University of Central Florida (UCF) researcher and assistant professor Yang has developed a breakthrough hybrid nanomaterial that uses the power of an existing green energy source, solar energy, to turn seawater into hydrogen fuel. This process has the potential to eliminate many of the issues presented by the use of hydrogen fuel. > Ensia: Could This One Simple Idea Be The Key To Solving Farmer-Environmentalist Conflicts? (Brian Bohman). Farmers applying nitrogen fertilizer in quantities greater than needed can contaminate groundwater, often leading to conflicts with environmentalists. Farmers and water resource managers in Perham, Minnesota have worked together on both securing clean drinking water and ensuring a strong agricultural economy, with an emphasis on conservation as a part of a business plan for farming. > Citizens for Sustainability: Monthly Meeting-Forum, Sat., Oct. 14, 10-11:30 a.m., St. Anthony Community Center, 3301 Silver Lake Road.